The summer season is officially in full swing, and we now have our lifeguards working full time. We would like to ask that everyone review the pool rules listed in last month’s newsletter, or on our website waterleaffalls.com. We would like to remind everyone that the pool is CLOSED EVERY MONDAY except holidays that fall on Mondays with no other exceptions. We use this day to allow our pool company to come in and maintain the pool in order to help it recover from the heavy use on the weekends. Secondly, we want everyone to keep in mind that the lifeguards are there to ensure the safety of everyone enjoying the pool. We have entrusted them with not only our lives, but the live of our friends and family who utilize the pool. Please show them respect as they are merely doing their job to keep everyone safe and preserve life. Please remember that it is still your responsibility to watch your children at all times. We would also like to invite everyone to come out and support all of our committees in all that they do. Our committees are in need of volunteers and would love to have help from all of you. And don’t forget to enjoy all of the events, and block parties to meet your neighbors and raise awareness for the safety of our neighborhood, as each every one of us is responsible for what goes on in our community. Please check the calendar in this newsletter, or on our website for all of the events and meetings we’ll be having in the future. Have fun, enjoy your summer, and be safe! Have an alarm installed even if you choose not to have it monitored. Burglars will not stay if an alarm is going off. Stop all deliveries or arrange for a trusted neighbor to pick up your mail, newspapers, and packages. Have a neighbor place garbage cans at the curb on your normal pickup day and return them after the garbage pickup is made. Plug in timers to turn lights and a radio (talk show) or television, on and off, at the appropriate times. Have several throughout the house. Turn the bell or ringer on your telephone down low. If a burglar is around, he/she won’t be alerted to your absence by a ringing telephone. Let your neighbors know when you will be gone. Have them call the police if there is any suspicious activity. Ask a neighbor to occasionally park in your driveway. Business is certainly booming in Kyle and there are a lot of exciting options coming to us in the near future. The Hays Free Press reports some changes coming to Center St in downtown Kyle. You can expect to see a new Chinese restaurant and the owner of Center Field is reportedly looking to open a dance venue at the old Center Grocery. Walmart construction has begun across the street from Lowe’s and is expected to be completed by January 2015. 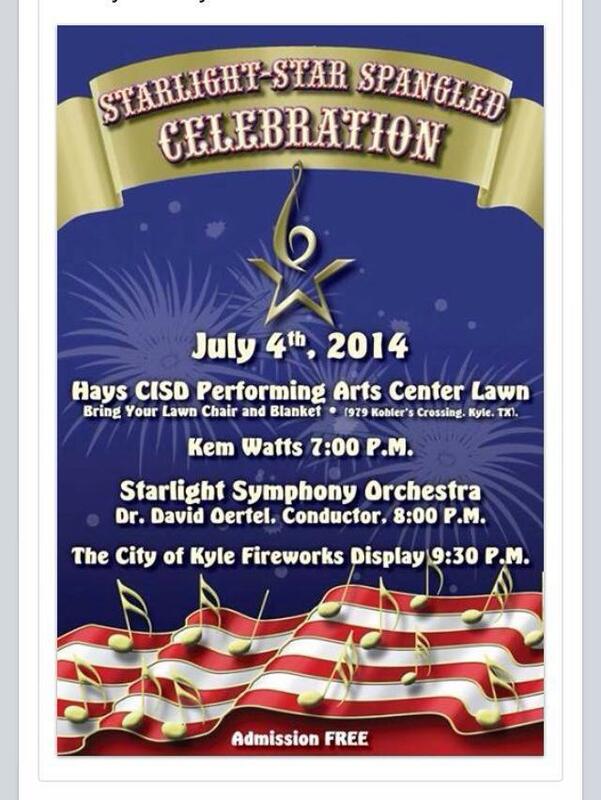 7:00 pm – Hays CISD Star Spangled Event *NEW this year! Hays CISD’s PAC will entertain with music until the fireworks start. The free public program starts off with Kem Watts, a local singer and songwriter, performing from 7 pm – 8 pm followed by Starlight Symphony Orchestra from 8 pm – 9:30 pm. 9:30 pm – When it gets dark enough, around 9:30 pm, the fireworks show will launch from the driving range. Find a spot early enough to see the tall water tower that is next to the Hays CISD PAC on Kohler’s Crossing. If you can see the water tower, you will have a great view of the fireworks.Parking in paved parking lots around the intersection of Kohler’s and Kyle Parkway are the safest locations. The approximately 15-20 minutes of “ooohs and ahhhs” will cap off a day of fun in Kyle. 9:30 am – Children’s parade in the morning with free activities at City Park following the parade. Parade line up begins at 9:00 am. in the parking lot next to Garcia’s Mexican Restaurant on Main Street. Anyone can participate, no registration required, just show up! Decorated bikes, wagons, scooters, strollers and more will take a short parade route to City Park starting at 9:30 am. Concessions provided by Buda Chamber of Commerce. There will be various Children’s activities from 9:30 am to 11:30 am at the park (bounce house, water slide, magician). 9:30 pm – Evening Fireworks at Buda City Park For more information call 512-295-7170. 6:00 pm – 10:00 pm at San Marcos Plaza Park San Marcos Plaza Park is located on the banks of the San Marcos River at E. Hopkins Street and N. CM Allen Parkway. Festival grounds will open at 6:00 pm with food and activity booths and Cheryl Murdock opening! Children’s parade registration begins at 6:30 pm with the parade and costume contest beginning at 7:00 pm. 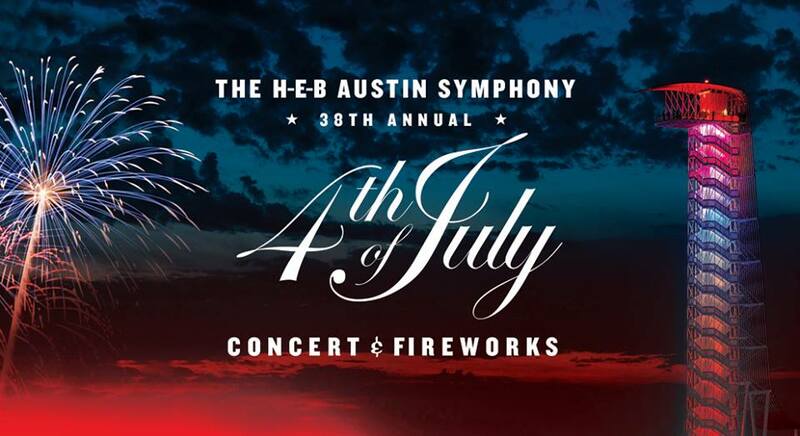 David Ybarra and Friends band plays at 7:30 pm Fireworks will begin at 9:30 pm- Free parking for Summerfest will be available at the Public Library and Activity Center parking lots, City Park and Texas State’s Strahan Coliseum parking lot. More information here. Per the City of Kyle: Remember it is unlawful for any person to manufacture, assemble, store, transport, receive, keep, offer to another or to otherwise have possession with the intent to sell, use, discharge, cause to be discharged, ignite, detonate, fire or other wise set to action any fireworks of any description, except under special permit as authorized by the city or in the fire code adopted by the city. Any person in violation, in the city of Kyle, may be charged by a class C misdemeanor. The fines for possession or use of fireworks is anywhere from $500 up to $2,000. Please celebrate responsibly and if you want to enjoy fireworks this year, we encourage you to visit one of the nearby city celebrations. First Saturdays are to raise money and awareness for a different charity that does good in Kyle. This month’s concert benefits PAWS! Entry is by donation and 100% of donations are given the the charity of the month. Tickets handed out at 7:00 pm, Gates open at 8:00 pm Movie begins at sunset. Join us for a special showing of “Surf’s Up” “Dive In Movie” at Kyle Pool. On this night, the pool will close at 7pm and all patrons must leave the pool. Pool staff will begin handing out admission tickets at 7pm no earlier. on the night of the movie, until all 230 tickets are handed out. One ticket per person no exceptions (if you have children, please make sure they are in line with you at the time tickets are being handed out). The pool gates will reopen at 8pm and only admit those 230 people with admission tickets. If you do not have a ticket, you will not be admitted. All regular pool rules apply to all attending, and maximum pool complex capacity is 230. Gates open at 8pm and pool closes 30 minutes after conclusion of the movie. See if you can break the case like Sherlock does at the Teen Mystery Party. Watch the show “Sherlock,” play a life size Clue Game, and make a detective kit to take home. No registration required and young adults ages 12 to 18 are welcome to attend this event. If you have any questions please feel free to contact us at 512-268-7411 or via email at circulation@cityofkyle.com. You may also drop by the library to speak with a friendly staff member. 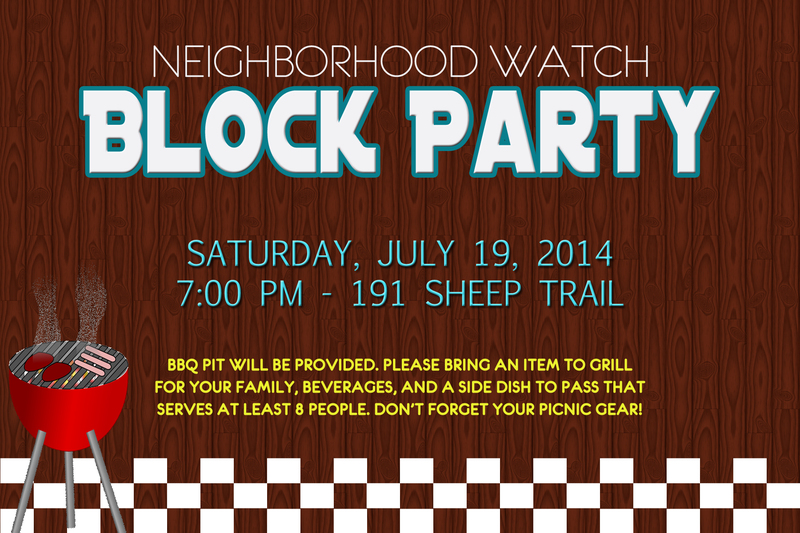 Join us Saturday, July 19 at 7:00pm in the driveway of Jason Lolley and Cathy Frankowski, 191 Sheeptrail. Come meet your neighbors!! We had such a great time at the last BBQ we’ve decided to continue these every other month. Please bring your families item to grill (Barbecue pits will be provided), beverages and a dish to pass that will serve 8. Also please bring your picnic gear, i.e. chairs, blankets, etc. We have once again invited the Kyle Police and Fire Departments to join us! Neighborhood Watch had a great meeting this past month and we send a big thank you to Mike Leas of Breadcrumbs ID and Texas DPS. They informed us on the topic of missing children and adults, and the many ways communication is sent out for anyone missing. We learned a lot of what goes on behind the scenes and what we need to do to help law enforcement find a missing person. There is no Police Blotter this month, as it was not received from KPD. Happy 4th of July Waterleaf! Please celebrate safely and keep in mind that fireworks are not allowed in the City of Kyle. Let’s try and be respectful of each other. Many have babies and children sleeping and pets who are very frightened by fireworks. Let the professionals do this entertaining for us! Congratulations to July’s Yard of the Month! !